This dress was designed by Antonio del Castillo (1908–84) for the couture house of Lanvin in 1957. It was embroidered by the house of Lesage, a famous French embroidery firm. The design was created by François Lesage (b.1929), who inherited the business in 1949, and was inspired by the embroidery on 18th century waistcoats. Gowns that were to be embroidered were usually simply cut, like this one, to show off their sumptuous surface detail. White silk zibeline evening dress, with shoulder straps, fitted bodice, tulip-shaped skirt with slight gathering. Embroidered in vibrant purple chenille and diamante in a formal floral design. This dress was embroidered by the Paris embroidery house of Lesage. Designed by Francois Lesage, it was inspired by the embroidery on 18th century waistcoats, of which he was/is fascinated by. The dress was worn and given by the Countess of Drogheda. 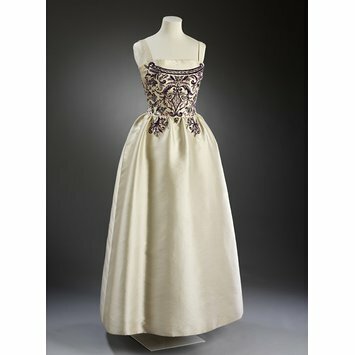 The same model was also made for the actress Vivien Leigh, who wore it with a purple silk satin stole on at least three occasions between 1961 and 1963. Her dress was sold at Sotheby's in 2003. 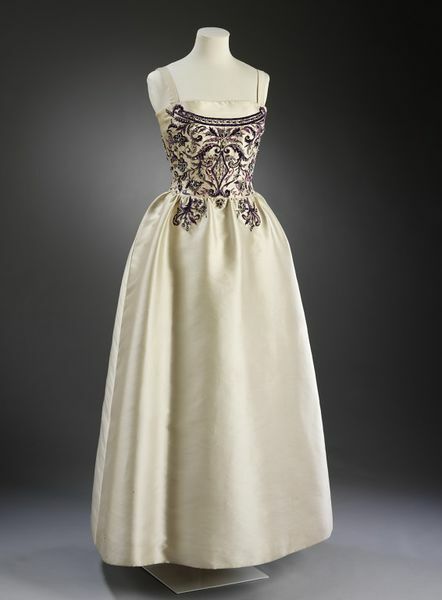 Evening dress of embroidered zibeline, designed by Antonio Castillo for Lanvin with materials manufactured by Staron, Paris, 1957. Lesage's embroidery was inspired by that on 18th-century waistcoats. Concentrated on the bodice, it creates a lower, 'trompe l'oeil' neckline while leaving the skirt quite plain.